Pesto certainly isn't on the menu of traditional items for Rosh Hashanah. But, I was just outside gathering cherry tomatoes for tonight's feast and I couldn't help but notice the basil...lots of it! 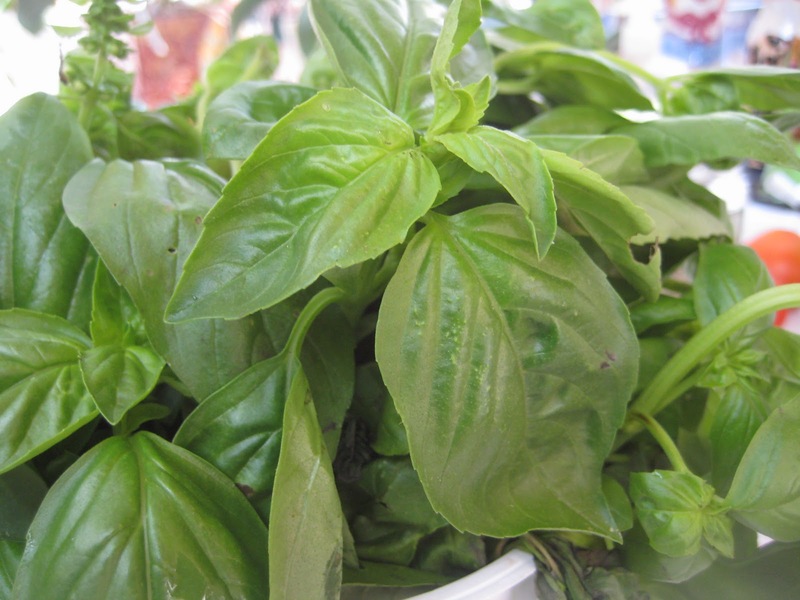 Thai basil, lemon basil, cinnamon basil, boxwood basil and, of course, Italian basil. Pesto is a great way to use up a lot of basil. It's so quick and easy to make (5 minutes, really) that I decided to grab some basil and make some. I can get it done while waiting for the pot of water for kneidel (matzo balls) to come to a boil. 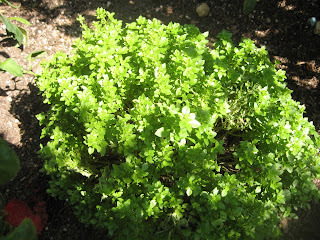 Pesto is wonderful to drizzle on salads, maybe heirloom tomatoes if you have any left, or tossed with boiled potatoes. It's incredibly versatile so think beyond a bowl of pasta. The best thing is that pesto freezes really well, So, even if I'm not serving it today or tomorrow or even next week, it can go into the freezer to enjoy at another time. I have several recipes that I like to use for pesto. This is one of my favorites. It uses both pine nuts and walnuts so the flavor is a bit more complex than some recipes. While I'm not a cheese eater, I do love pesto. I usually take some of the basil, garlic and nut mixture out before adding the cheeses. I promise you, it's delicious either way! 1 cup extra virgin olive oil - use the best - it makes a difference! Shut the motor off. Add the cheeses, a liberal grinding of black pepper and a large pinch of salt. Turn the motor on just to combine the ingredients. Transfer to a bowl and cover until ready to use. 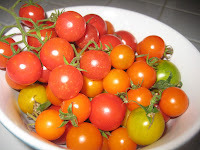 With more people growing tomatoes in their home gardens than any other vegetable I get lots of questions about tomato growing on any given day. Today, I received an email from someone questioning the black containers I use. This may be repetitive for some readers but it's an important question so I'm happy to answer again. 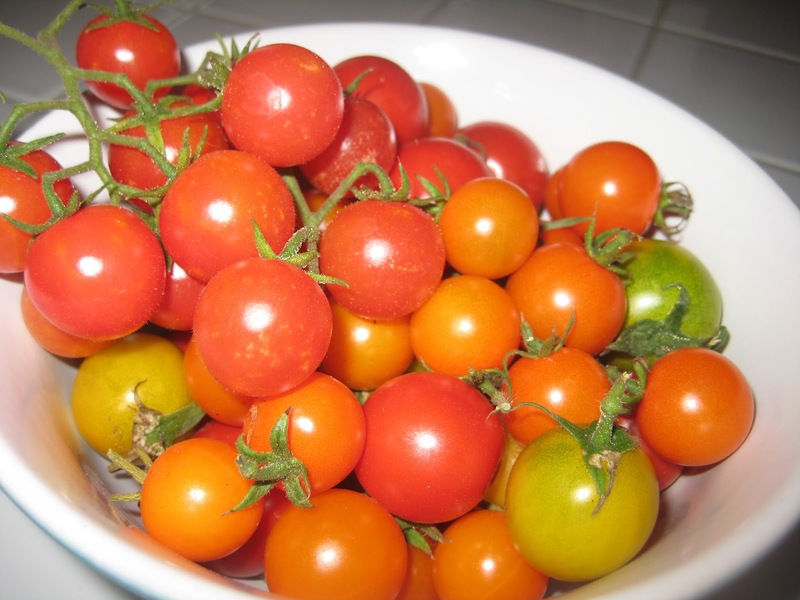 Here's the story...when growing tomatoes in containers the containers need to be large enough to hold lots of soil. Minimum of 15 gallons. 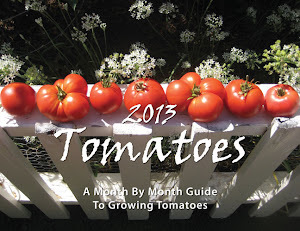 Tomato roots are huge and they need the soil volume to feed, support and get moisture to them. The least expensive and easiest to find pots around here happen to be black plastic. So, I use them. Lots of them. Now, it also gets quite hot here in the west San Fernando Valley. Couple that with the fact that my containers are sitting on a former basketball court and you'll get an idea of just how hot my containers and, therefore, my plants can get. The pots all go up on "pot feet". I think this helps with drainage and it also creates a small gap between the pot and the heat emanating off the concrete. Then, each pot is individually wrapped in burlap. I buy burlap bags at the local feed store and cut them open. They make it almost twice around the pots. Then I use garden staples to hold them in place. The pots remain wrapped for the entire season. When it's really hot I water the bags to help cool them down and hopefully cool the pots a little. The point here is this: black pots absorb heat and on really hot days the root balls will cook! Tomato leaves and fruit like some heat but the roots do not. Last, I follow 3 different weather services daily. 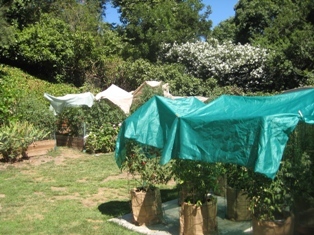 When the forecast gets anywhere near 90 I put up shade cloth. It drapes over frames made of pvc pipe and doesn't look pretty. 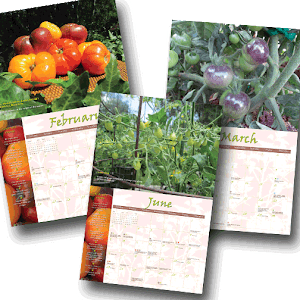 But, we all have our priorities, and mine is to protect my tomato plants as much as possible.